Although it might be a bit late to order for this year, Liz Langley’s Frenchie Halloween card is just one of many equally adorable French Bulldog designs over at Henri Hopper. It could be the cutest halloween card i’ve ever seen! this listing is for one folded note card featuring my original illustration of an adorable little frenchie perched on a jack o’ lantern, happily gnawing on its stem. underneath, the greeting reads, “happy halloween!”. it’s perfect to send your halloween wishes this year to any friend or frenchie lover, or even from one pet to another. henri’s sending it to all his friends this year! he hopes he gets some candy in return! i make each card in my home studio by printing my original illustration of a french bulldog and pumpkin onto the front of each smooth, bright white folded card. they are a2 size (4.25 x 5.5 inches). the inside is blank for your greeting, and each card comes with a coordinating kraft-brown envelope. this card is also available with the alternate greeting “trick or treat!”. sets of 5, 10 or more are also available. see other listings or just message me for details. card will be shipped to you in a non-archival, but compostable and earth-friendly bio bag (archival cello bag available on request) inside a sturdy bend-proof mailer by first-class mail. all cards and envelopes contain 30% post-consumer content and are FSC-certified to promote responsible use of forest resources. all artwork is © liz langley and created in my smoke-free home. 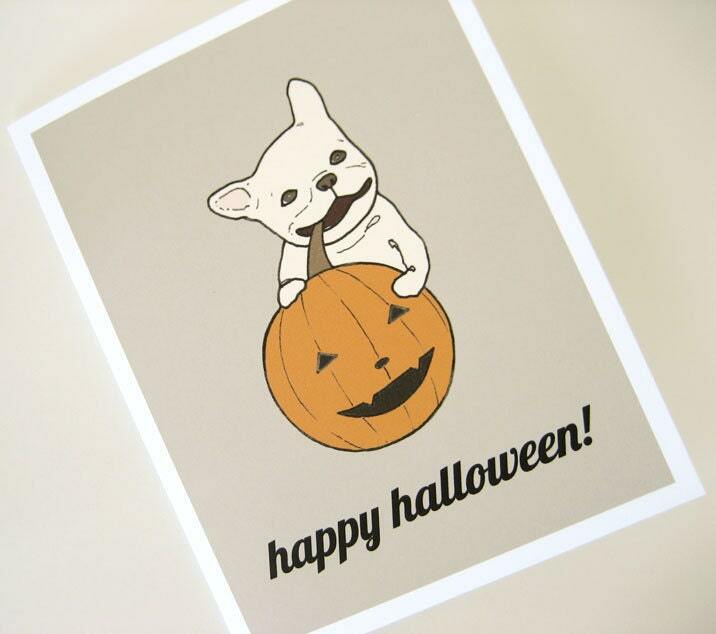 via french bulldog with pumpkin halloween card // happy by henrihopper.